Are you having fun yet? We sure hope so!! 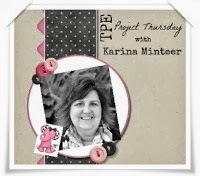 We have another wonderful tutorial to share with you now. 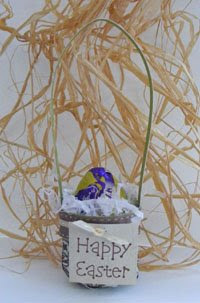 Carol Houghton is going to share how to make some really cute Easter baskets. 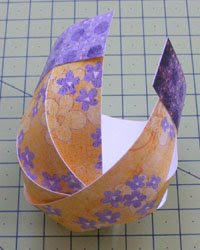 This tutorial is being shown to you today with the kind permission of Leslie Miller, the original creator of this project. 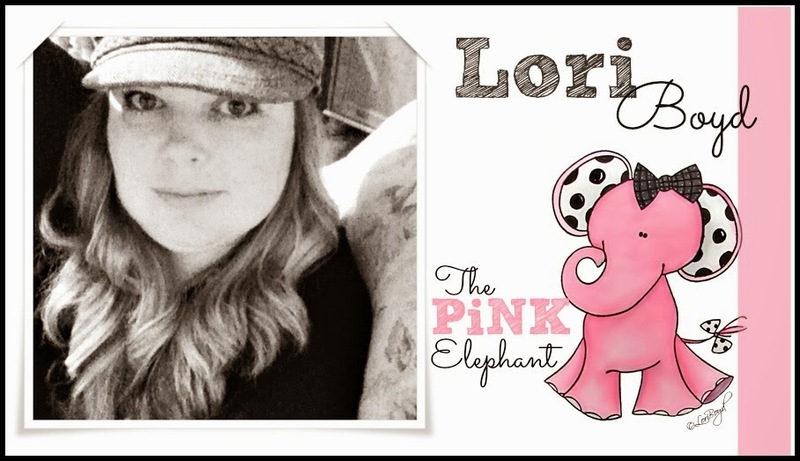 "Thanks Leslie, am so glad you allowed me to show this today for The Pink Elephant Easter Blog Hop"
The picture below shows the reverse side of the paper. You could of course use double sided paper if you wish. 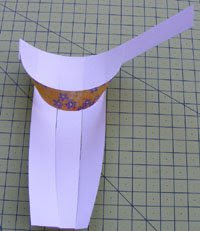 Apply a strong glue or adhesive tape to the inside of the basket trim and adhere the basket slats along the left side as shown, leaving no spaces between the strips. Now the basket will start to take shape....as shown in this photo, take the slat on the far left and bring across to the next position on the basket trim. It naturally forms a loop. Secure with adhesive. 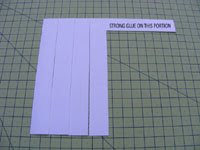 Continuing from the left side, bring the next slat over in the same manner, securing with adhesive to the horizontal strip as you go. Each slat will overlap the previous one and the basket will form it’s natural round shape as you go along. 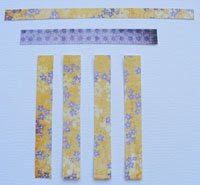 You will have a small section of trim left over which you will stick over the opposite end to secure your basket shape. The handle can now be attached. At this point you may like to add some ribbon and it helps to hide the joins too! Pop in some shredded tissue and your favourite treats! These baskets are very easy to make and take no time at all. They are perfect for small children to hold because they are small & lightweight. 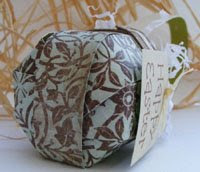 They would also make wonderful place setting gifts at your Easter Dinner. 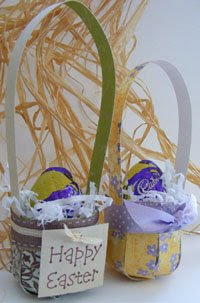 I hope you will have a try at making some of these cute baskets, they are fun to do! Thanks Carol! Aren't these baskets just adorable? I know this is yet another thing that I want to make! We have alot more in store for you over the weekend so be sure to check back often or follow our blog so you don't miss a thing! Don't forget to scroll down to check out the mini challenge, blog candy hop and Find Ella game! 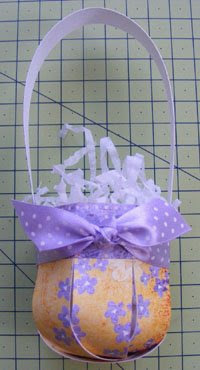 cute baskets and wonderful tutorial !! So cute!! I am going to give this a try too!! Thanks!! These are so cute. Thanks so much for the tutorial. WOW Carol...I love them!! Super super cute!! I love your tiny Easter baskets! They are extra cute because they are so little!